Alex Jones exposes the agenda behind the attack on the USS Liberty in 1967 by use of recently declassified documents and the President Johnson tapes which are as significant if not more then the Nixon tapes. The attack on the USS Liberty was a false flag operation fully approved by the LBJ administration (think Tonkin gulf) to serve as a pretext to a nuclear attack on Egypt and a full take over of Middle East oil. 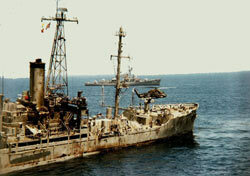 What happened to the USS Liberty? The USS Liberty was a virtually unarmed American navy ship that was attacked by Israeli planes and torpedo boats on June 8, 1967. What were the American casualties? 34 American sailors were killed and 172 injured that day, a casualty rate of 70%. This is among the highest casualty rates ever inflicted upon a U.S. naval vessel. What was Israel's explanation for the attack? Israel claimed the attack was "a case of mistaken identity"; that they didn't know it was an American ship. Why do people question that explanation 40 years later? The ship's survivors were afraid to speak out in the early years because of threats of "court martial, imprisonment or worse" if they did not remain silent. However, as time passed, they have stepped forward to say the attack was deliberate. Recently, high government and military officials have suggested that not only was the attack deliberate, but that the US government covered up the incident. In 2003, an Independent Commission of Inquiry found that Israel committed "an act of war" against the United States (see Findings of Independent Commission). In addition, the Navy's chief attorney to the original 1967 military Court of Inquiry has issued a statement that orders to cover-up the incident were issued by President Lyndon Johnson and Secretary of Defense Robert McNamara [see Statement of Captain Ward Boston, USN, JAG (Ret.) [PDF]. Did Israel have reason to believe the USS Liberty was an Egyptian ship? Israel says its pilots and torpedo boat commanders confused the USS Liberty with the al-Quseir, an Egyptian ship allegedly firing upon its forces in the Sinai. But there was no Egyptian naval bombardment that day; nor did the al-Quseir (an unarmed 1920s-era horse carrier in dry-dock in Alexandria) bear any resemblance to the Liberty. Isn't it difficult to identify a ship if you're in an airplane? In 1967, the USS Liberty was the most sophisticated intelligence ship in the world, with dozens of large antennas, including a large moon-bounce "satellite-dish" mounted on a tall structure near the stern. It may have been one of the most easily identifiable ships of any navy in the world. With a displacement of 10,000 tons, it was four times the size of the antique Egyptian transport it is claimed to have resembled. Freshly painted, the Liberty carried 10' high white identification numbers on its bow. Egyptian hull markings are painted black. Doesn't Israel say that the Liberty flew no flag? According to American survivors, a 5' by 8' American flag was hoisted early that morning and was flying all day until it was shot away by attacking aircraft. Within several minutes, it was replaced by the giant 9' by 13" holiday ensign, which flew for the duration of the attack. Could Israel have thought the ship was in a war zone, acting suspiciously? According to surviving crewmembers, Israeli reconnaissance aircraft closely studied the Liberty for more than six hours prior to the attack, one flying within two hundred feet of the ship. At all times the Liberty was a clearly marked American ship in international waters, proceeding at a speed of only 5 knots. What was the weather like the day of the attack? Weather reports confirm that it was a clear day with unlimited visibility. The Israeli reconnaissance planes could have seen the Liberty's crew sunbathing on the upper decks just before the attack. The flag was flying in a 12-knot breeze for most of the afternoon. Doesn't Israel say they ended the attack the minute they saw someone hoist an American flag? The Israeli attack by combined air, naval and army forces spanned two hours - as long as the attack on Pearl Harbor. The air attack alone lasted approximately 25 minutes: consisting of more than 30 sorties by approximately 12 separate planes using napalm, cannon, and rockets which left 821 holes in the Liberty's hull. Following the air attack, three Israeli motor torpedo boats torpedoed the ship, causing a 40' x 40' wide hole in her hull, and machine-gunned firefighters and stretcher-bearers attempting to save their ship and crew. More than 3,000 machine-gun bullet holes were later counted on the Liberty's hull. After the attack was thought to have ended, three life rafts were lowered into the water to rescue the most seriously wounded. The Israeli torpedo boats returned and machine-gunned these life rafts at close range. This was followed by the approach of two large Israeli Army assault helicopters filled with armed commandos carrying what appeared to be explosive satchels. After hovering over the ship for several minutes, making no attempt to communicate, they flew away. Did the Liberty send out a distress signal when it was under attack? Throughout the air attack, the Liberty's crew found it difficult to transmit a distress signal because the attacking Israeli aircraft jammed all five of the Liberty's American, not Egyptian, emergency radio channels. However, a message did reach the U.S. Navy command in the Mediterranean. What was the American response time? Although American carrier-based air support was only 40 minutes away, help did not reach the USS Liberty for seventeen hours. Navy fighters were launched from the aircraft carriers America and Saratoga while the Liberty was under attack. However, they were quickly recalled by the White House. This is the only instance in American naval history where a rescue mission was cancelled when an American ship was under attack. Why would Israel have deliberately attacked an American ship? Israel's motive for launching the attack has never been determined with certainty. One hypothesis is that Israel intended to sink the ship (with no survivors) and blame Egypt because this might have brought the United States into the 1967 war. Another hypothesis is that the Liberty was gathering intelligence about activities that Israel did not want revealed. Examples might include the massacre of Egyptian prisoners of war that was then occurring in the Sinai, as well as Israel's impending invasion of Syria. Has the incident been investigated in the past? Some people say that there have been thirteen official investigations all concluding the attack was a case of mistaken identity. Several were conducted by Israel. Upon examination, however, every single one is based upon the conclusions of the original 1967 US Navy Court of Inquiry, which accepted the Israeli version, but which has now been exposed by its chief attorney as a cover-up. Did the surviving crewmembers testify in the investigations? In not one of these investigations were any of the Liberty's surviving crewmembers permitted to publicly testify. Why would the White House prevent the rescue of an American ship? It is not known why the White House ordered the recall of the planes that had been sent to rescue the Liberty, nor why they ordered that the survivors remain silent. This is why many are calling for a new Court of Inquiry by the Department of the Navy, with congressional oversight, to take public testimony from surviving crewmembers and otherwise thoroughly examine the circumstances of the attack. Why is this significant for the American people 40 years later? Any policies that paralyze the elected leadership of the United States to the extent they become unable or unwilling to protect Americans and American interests, endangers not only the safety of all Americans but also the national security of the United States. Doesn't America have a special relationship with Israel? No nation or people should be above the law; nor should American interests be subordinated to the interests of any foreign nation. Those responsible for ordering the attack and the resulting killings of American sailors should be held accountable for their actions.